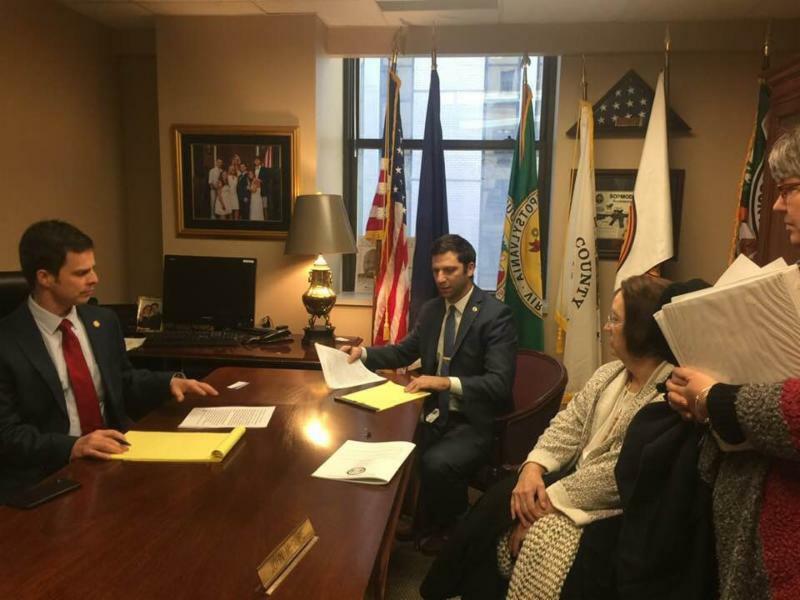 Yesterday, marked the halfway point of the 2019 General Assembly Session, known as Crossover, when all the bills that passed the House go to the Senate and vice-versa. 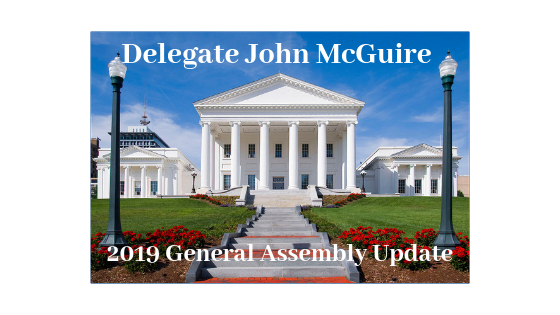 The Committee process plays a vital role in evaluating legislation through Virginia's bicameral General Assembly. I'm privileged to sit on several committees: Education , Privileges & Elections , Cities, Counties & Towns , and Science & Technology . Within the four committees, I also serve on four sub-committees. 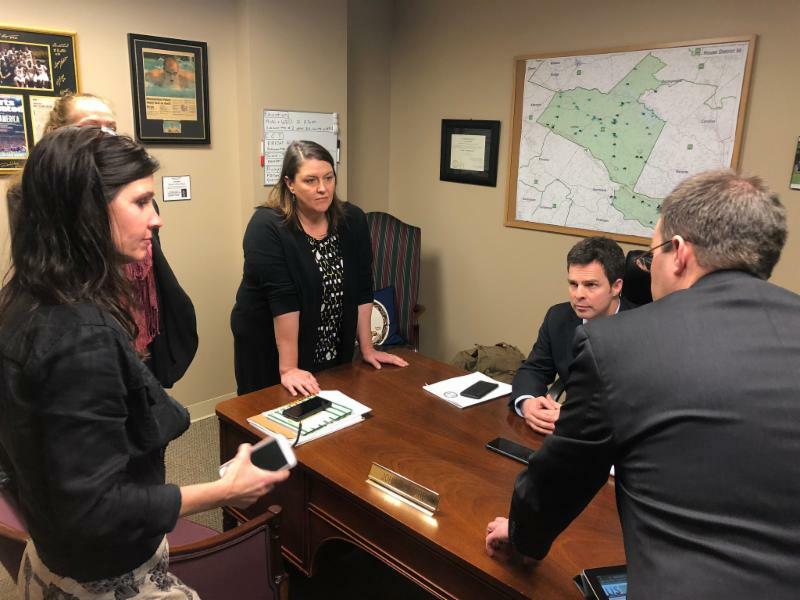 It is a busy time sitting on committees, floor sessions, meeting constituents and issue advocates and working on my own legislation that primarily developed as a result of listening to many of you while out and about in the district. It is an honor to serve Virginia House District 56. 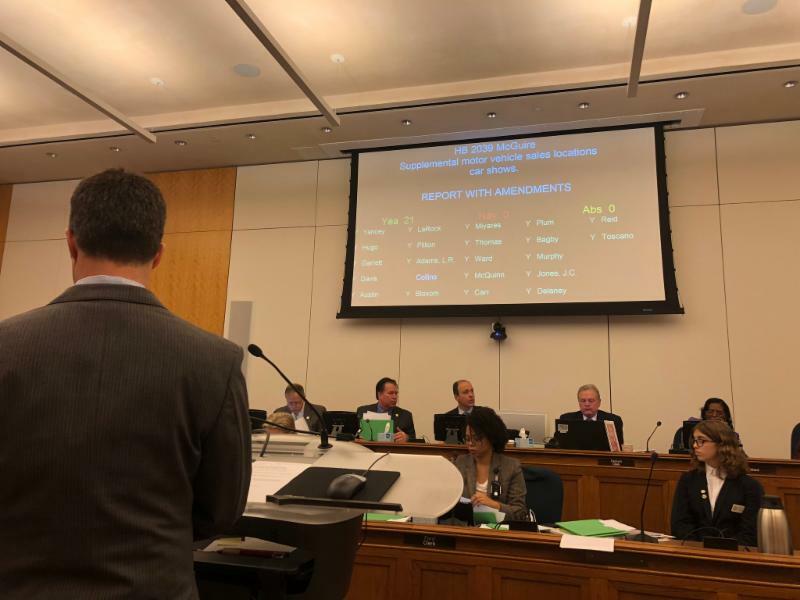 This session, I have presented legislation dealing with the free, fair and impartial administration of elections, making naloxone accessible within our schools to combat the opioid crisis and save children's lives, combating elder abuse, increasing penalties for human trafficking, encouraging the state to contract with disabled veterans, and promoting technological advancement within Virginia's schools. I appreciate hearing from all of you who have contacted me via email, phone calls, in-person visits and mail. ﻿We currently have four great bills that have passed the House and are now in the Senate. I will spend the next three weeks testifying to the Senate and advocating for their passage in the Senate and on to the Governor's desk. The Opioid Crisis is ravaging our beloved Commonwealth. I made a promise, I would do everything in my capacity to save those suffering from this disease. 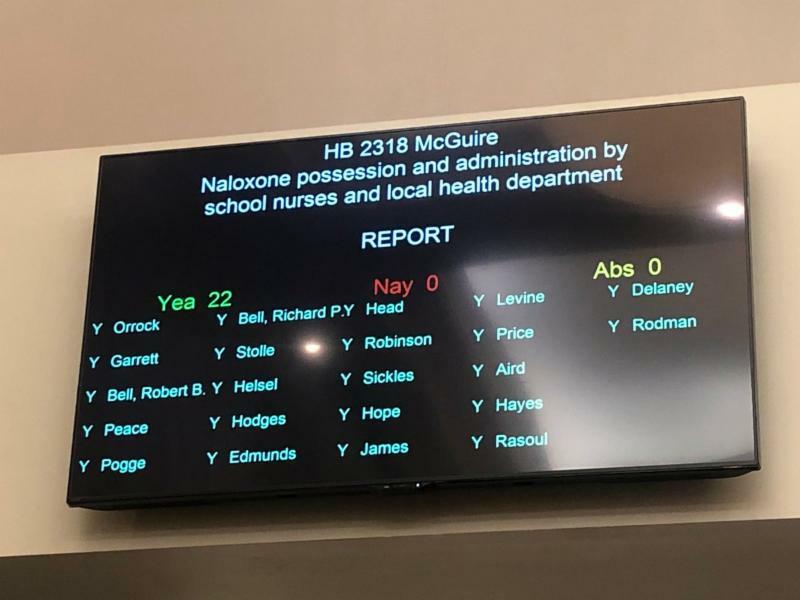 Our bill, HB 2318 is a step forward in that important promise as it adds nurses and other health services staff in our schools to the list of individuals to possess and administer life-saving, N aloxone in situations where a student has suffered an overdose. The bill passed both Committee and House unanimously. See my comments on the bill here. 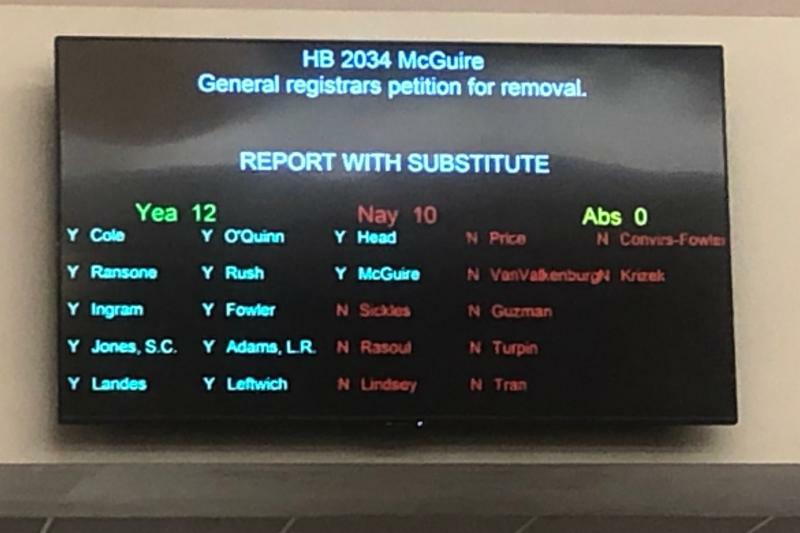 HB 2034 , interjects due process into instances where a general registrar needs to be removed from office when they have failed to perform their duties according to law. 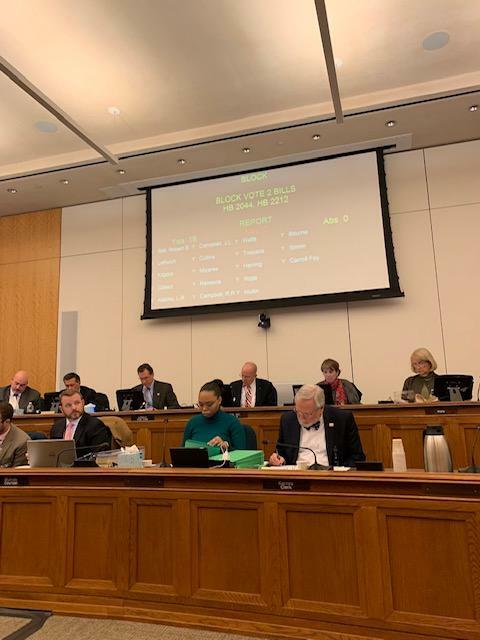 The bill removes partisan political influence that has occurred within Virginia's electoral process and supports non-partisan and unbiased electoral boards. the bill passed sub-committee with a 4-2 vote, C ommittee with a 12-10 vote and the House passed with a 53-42 vote. See my comments on the bill from the House floor here . HB 2044 , provides for seven additional days for health care providers to respond to medical records subpoenas. 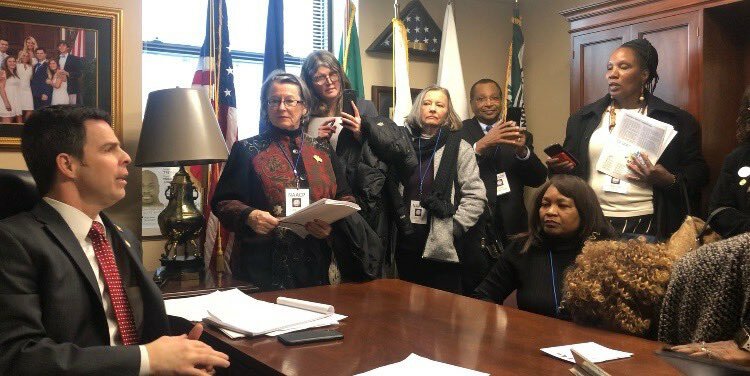 It was brought to my attention by a constituent that current law was not protecting recipients of medical subpoenas by ensuring that they have enough time to appropriately and adequately respond. The bill passed both Committee and House unanimously. HB 2039 allows an auto dealer participating in a new car and truck auto show to obtain an off-site license with minimal restrictions. This bill was brought to my attention after auto dealers were having issues obtaining off-site licensing to sell cars at Richmond Raceway during the two big NASCAR races each year. The bill passed both Committee and House unanimously and I look forward to testifying in the Senate. Our children are precious. I never thought in political office we would be fighting for the lives of defenseless children. 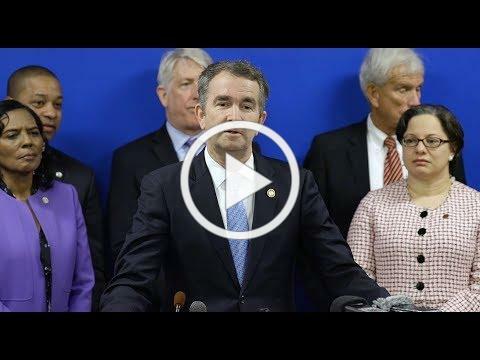 Virginia Democrats, last week revealed just how extreme their abortion policies are, and made abundantly clear what would become the law of the Commonwealth if they ever won a majority in the General Assembly. Watch the press conference above to hear, notably, Lieutenant Governor, Justin Fairfax's remarks to that end. Twenty one House Democrats have co-sponsored, this bill to lift all meaningful restrictions on late-term abortions. This is a stunning and open acknowledgement that the policies being proposed by Democrats would allow infanticide. The governor, in his own words, admitted that he would let a newborn baby die on a hospital table if that was what the mother desired. These comments, and these policies, are reprehensible and outside of the mainstream. Unfortunately, they appear to represent the honest position of Democrats in Virginia. Supporters of this legislation are claiming that these comments are taken out of context, but these are their own words in raw, unedited form. 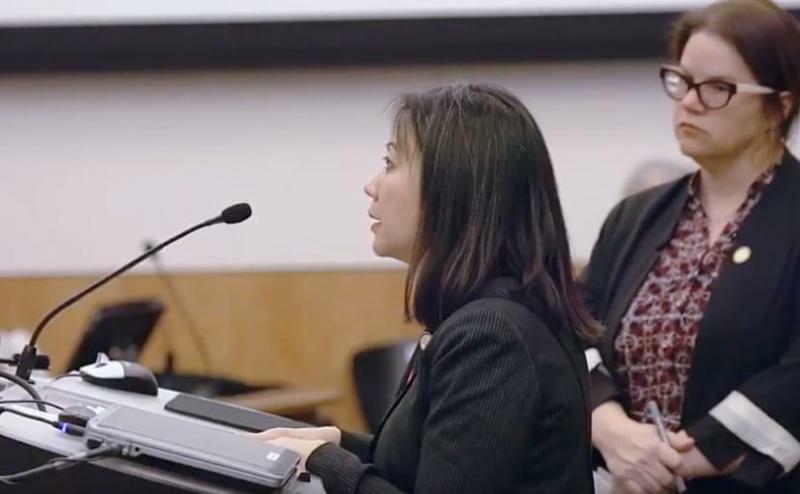 You can view the full six-minute video of Delegate Tran here . The governor’s comments were aired in-full, live on the radio. W atch the Governor here . 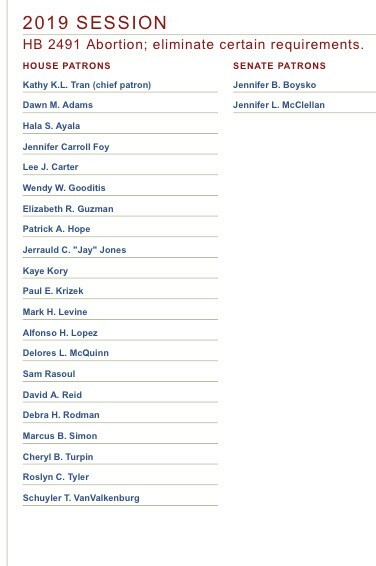 Here is a list of General Assembly Delegates and Senators who copatroned Delegate Tran's HB 2491. 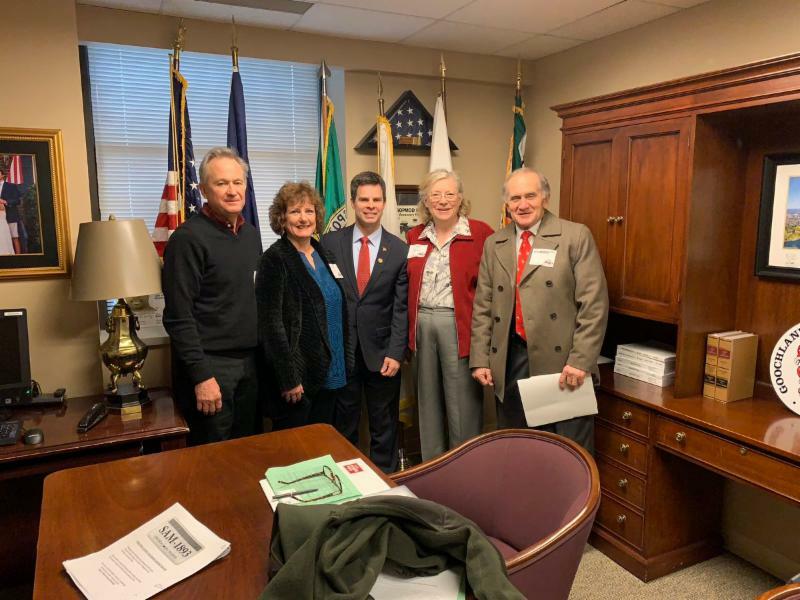 It has been a pleasure to meet many constituents and have enriching conversations regarding legislation that we are working on. As we navigate these difficult times in our Commonwealth, I am committed, as your Representative, to adhering to the principal duties of government, as stated in our Declaration of Independence, i.e. the protection of life, liberty and the pursuit of happiness. I look forward to seeing you around the district. In the meantime, please continue the teamwork and let me know what you are thinking. 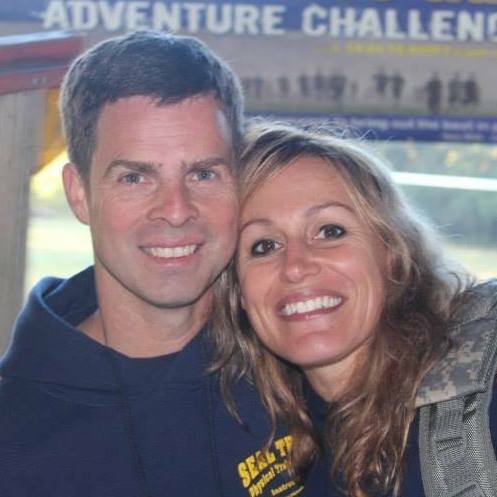 You can reach me at deljmcguire@house.virginia.gov or 804-698-1056. Call, email or stop by my office and I'll be glad to speak with you and show you around the Capitol. We are setting up another round of meet and greets around District 56. Details to be sent soon!